How to deal with low/ high sugar problems. When we talk about sugar it’s not only one which we add in food. Sugar is a very basic form of energy which body recognises and uses for its metabolic processes. Sugar is required for each and every cell in the body especially liver cells, brain cells and eye cells. It becomes very important to take care o the sugar levels in the body. Here we will talk how to deal with low/High sugar problems. All the food which we eat i.e. carbs proteins and fats has ability to get converted into sugar if required by the body. Body cells utilises as required. If there is surplus supply of sugar to the body than excess gets converted to fat and if there is deficiency in sugar supply than body uses proteins and fats as sugar. So if there is excess or less sugar supply to the body the mechanism in the body alters the natural functioning of the body causing symptoms like hypoglycemia (http://en.wikipedia.org/wiki/Hypoglycemia) and hyperglycaemia (http://en.wikipedia.org/wiki/Hyperglycemia). 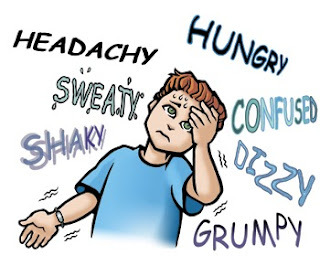 Hypoglycemia is very commonly seen among people who over stress their body physically or mentally neglecting the nutrition. Hypoglycemia is basically dropping in the sugar levels in the blood. (For normal sugar levels check: http://www.medindia.net/patients/calculators/bloodsugar_chart.asp ) Hyperglycaemia is just the opposite. It deals with increase in blood sugar levels. Person frequently facing hypoglycemia should keep any form of plain sugar with them. I could be in a form of table sugar, juice, chocolates, biscuits, energy drink etc.) If you feel hypoglycaemia immediately have a portion of sugar meal, this will give you quick recovery. After this when you fee little batter you can have a high carbohydrate meal. If you frequently face this problem then it’s better to consult your MD and also take Dietician advice. Hyperglycemia is little dangerous and reoccurrence is fatal. It is advisable to consult your physician and take proper treatment in terms of medicine and diet. 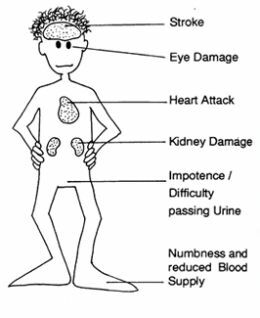 Reoccurrence of hyperglycemia is risky for vision, kidney and nervous system.